Trigger warning: Ableism, Autism Speaks, erasure, silencing, profanity. The Alpha Kappa Alpha Sorority, Inc. Omicron Pi Chapter will be holding an event in honor of Autism Awareness month, and will have a guest speaker from Autism Speaks. Don't miss out on what promises to be a great event! - There is no medical detection or cure for autism"
As an Autistic woman of color at Georgetown University, I am incredibly disappointed that a sorority originally founded to empower Black women has chosen to support the organization Autism Speaks. Autism Speaks is an organization that has very little support from actual autistic people, does not include autistic people anywhere in its leadership (Board of Directors or administration), engages in fear-mongering and pity-based advertising for "awareness," and works toward goals that fly in the face of what Autistic disability activists actually want for ourselves and our community. Autism Speaks is roundly criticized in the Autistic community, and definitely does NOT speak for us. I am a person, not a puzzle. I am Autistic, and I can speak for myself. If you wish to support the autistic community, there are many worthwhile organizations to support that do not promote the fear-mongering and pity-based advertising that paints autistic people as tragedies as puzzles but that do actually support and empower actually autistic people. Some of those organizations include the Autism National Committee, the Autism Women's Network, the Autistic Self Advocacy Network (full disclosure -- ASAN is my employer), the Autism Network International, TASH, the American Association of People with Disabilities, or the National Council on Independent Living. I would be more than happy to discuss this issue further, but I cannot in any way, shape, or form condone any form of support or validation of Autism Speaks and their harmful, dangerous practices. I strongly encourage the Omnicron Pi chapter of Alpha Kappa Alpha to reconsider its support of Autism Speaks and to host events that promote real dialogue about autistic people with autistic people rather than lending credence and a platform to Autism Speaks's oppressive and ableist rhetoric. 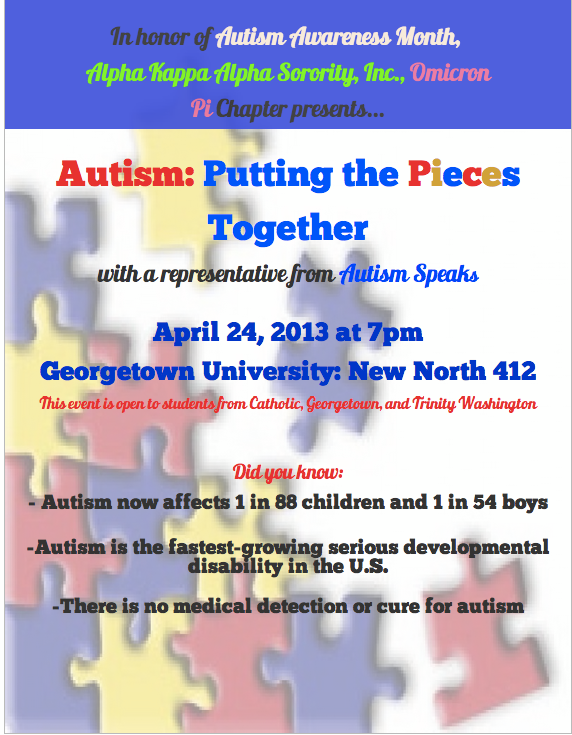 As an Autistic woman of color at Georgetown University, I am incredibly disappointed that a sorority originally founded to empower Black women has chosen to support the organization Autism Speaks. Autism Speaks is an organization that has very little support from actual autistic people, does not include autistic people anywhere in its leadership (Board of Directors or administration), engages in fear-mongering and pity-based advertising for "awareness," and works toward goals that fly in the face of what Autistic disability activists actually want for ourselves and our community. Autism Speaks is roundly criticized in the Autistic community, and definitely does NOT speak for us. I am a person, not a puzzle. I am Autistic, and I can speak for myself. Today, I discovered that my wall post had been deleted from the Facebook page without comment or private message. Needless to say, the email that I sent also did not receive a response. As a result, I am writing about this publicly. This was not my first course of action. My first course of action was to post a brief note on the Facebook event page directly for the organizers and anyone else to see; my second course of action was to contact the event organizers directly. However, their choice to passively avoid acknowledging my email as well as their choice to actively erase my message on the Facebook page have left me with no alternative but to broadcast this publicly. It is shameful that representatives of a sorority founded by and for women of color have chosen to engage in such appalling erasure and silencing techniques. At a minimum, they could have chosen to acknowledge my email, however succinctly or tactlessly. Instead, they chose to disregard my email and remove my wall post, neither of which were outright attacks on the sorority or the event organizers, but rather, statements about the organization Autism Speaks. Further exacerbating the seriousness of this situation is that I wrote explicitly as an Autistic person, a woman of color, and a Georgetown University student in both my email and Facebook message, and yet my perspective has been disregarded without any acknowledgement whatsoever. It is particularly egregious that people who are already multiply-marginalized by virtue of being women of color have chosen to commit the same types of injustices regularly perpetrated against them against someone from another marginalized population. I should hope that if an event were hosted by a group of white people discussing issues facing people of color in a highly problematic way, any attempt by actual people of color to contact the event organizers would not be met with the same humiliating erasure and silencing tactics that AKA's representatives have used here. Yet I know without a shadow of a doubt that if that were to happen and those people of color were to write publicly, anywhere, about such erasure and silencing, even people outside the community would be appropriately bothered and disturbed, while those genuinely interested in actively supporting and empowering people of color as allies would be outraged. At the same time, I know that this is not the case because this is autism and I am Autistic. Therefore, my voice doesn't count, and if I am capable of writing an email message (and going to Georgetown), I am obviously "too high-functioning" to matter or mean much. After all, only non-disabled people could possibly be capable of speaking on behalf of the poor, wretched persons who happen to live with the diagnostic label of autism. Autistic people, writ large, do not want to be cured of being autistic any more than women want to be cured of being women. The problems and challenges that we face in society across the lifespan do not occur because of the ways in which our brains work, but because of institutionalized oppression that dehumanizes us and permits murder, torture, and abuse to occur in the name of care, love, and treatment. The solution to the puzzle of autism is not a cure; it is an end to ableism. Autism Speaks's rhetoric of fear, pity, and tragedy serves a eugenics agenda with the elimination of autistic people as its ultimate goal. I don't know about you folks, but I would like very much to see my children grow up in a world where there are people like them, where they aren't pathologized and told to hate themselves, and where institutionalized oppression doesn't impact every waking moment of their lives. That is not the world that Autism Speaks wants, and actually Autistic people know this very well. Yes, I am upset. This is happening at my university. I refuse to be erased. Autism Speaks does NOT speak for me, and if anyone cares to dispute that, feel free to explore the vast array of essays, blog posts, and videos that actually Autistic people have made and written over a period of years to expose the many criticisms of this hypocritical and dangerous organization that has blood on its hands. Congratulations on speaking out so forcefully on this horrendous injustice. I am so very sorry that you had to do it in the first place. I understand how difficult this must be and I hope that it is the beginning of a change at Georgetown University. To think that they have students, like yourself and they still do not understand the implications of this, is truly very sad. It is disappointing that they are avoiding this issue. I understand that they are probably shocked because, like many members of the general public, they operate under the ideas that AS, as a charity, must be all good, and autism, under the tragedy/medical model, must be all bad. Continue the education, Lydia! Yep. Most people have still only seriously heard of the disease/disorder model of autism. A strong argument that what Autism Speaks is trying to do isn't right, because autism as a neurological configuration is a normal variant of the fabric of humanity, is probably radical beyond comprehensibility to people who have mostly only heard before that autism is an awful thing that keeps people from communicating or feeling. Fight the good fight. Refuse to be ignored. You are doing important work! Keep fighting the ignorance! It is a shame that they are unwilling to open up a dialog with you. I agree that they are probably shocked to hear the truth about AS, I was shocked too because I had been led to believe that a big charity like this one HAD to be doing good for the community. But, as you pointed out, it doesn't take much research to find the truth. I am curious to see if you attended the lecture and what your take was? Maybe next year, or the year after that, organizations first response to talking about Autism in April won't be "Let's have someone from Autism Speaks come because they are allll about the autism." With a lot of hard work, maybe AS will eventually just become obsolete. Keep up the fight, Lydia. AS is a goofball organization, helping actual autistic people like the naacp now helps african-american people. Maybe at the beginnings of each did they help....but now...they are just out for themselves. I don't think AS did help in the beginning. They've only existed since 2005, when the concept of neurodiversity was already well on its way to being a thing. They were founded by people who are still convinced that one day they'll find a cure and get their "real grandson back from autism." They used to push the vaccine theory way more. They used to put out way more offensive PSA's and videos than they do now. They've gotten *better* in some ways, just not enough to not be comically backasswards. It can be extremely hard for any social animal to be shunned by others in their species. Difficulties with reciprocal social communication make it a harder mountain to climb. Rather than fill your blog with a novel, I will provide a link to my own emotional expressions, not just logical ones, on what this has felt like to me in my life, as well. It has little to do with Autism Speaks, but everything to do with people speaking vs. people listening. I'm really sorry that people are being so willfully ignorant about the autistic experience. It's really awful when people decide to view their (outsiders') voices as having primacy over our own. You're a part of the Georgetown community, and your voice doesn't need to be shut out like that. It's frustrating that a lot of "autism activists" are so caught up in "having a voice for us" that they forget that we, too, have our own voices and should be allowed to express them. So, I took the 'stats' presented by Autism Squeaks and made them a little more... accurate. What do you think? Autism Speaks now seeks to harm 1 in 68 people and 1 in 42 men and boys. Autism Speaks' prevalence figures are growing. Autism Speaks is the fastest growing serious disability of the global economy. Autism Speaks costs a family $60,000 a year on average. Families with Autistic members receive less than 5% of the money donated to Autism Speaks despite the stated reason for the organisation's existence because the vast majority is channelled into wages and research into methods of genocide. Boys are nearly five times more likely than girls to have their murders advocated in Autism Speaks' PSAs. There is no medical detection or cure for the lack of empathy displayed by the non-Autistic board members of Autism Speaks.